Abu Dhabi: The brave girl who dodged security and ran to Pope Francis to deliver a letter on Tuesday morning is a fellow Latino who hails from Colombia. The girl in white shirt and pink pants went under the railings and ran to the Pope to deliver a card she made from 13,500km away. 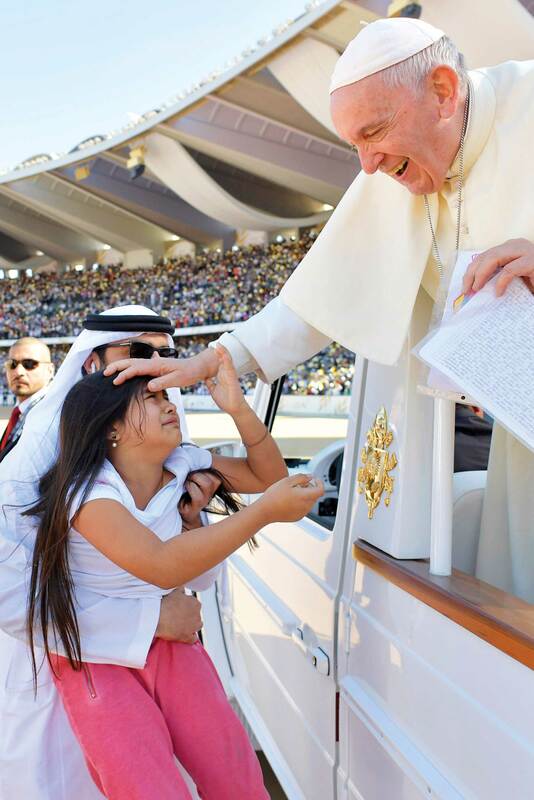 Her name is Gabriela and she travelled with her family to Abu Dhabi purposely to see the Pope. In the video livestream, which has now gone viral, Pope Francis motioned for the driver to stop upon seeing Gabriela escape security and charge to the Popemobile. An Emirati security then lifted her up so the Pope could bless her. Vatican photographers captured the moment—Gabriela’s innocent face, pleading for a brief audience with the pope. The pontiff lovingly touched her head, his lips smiling in admiration. Gabriela managed to hold the Pope’s hand before the encounter ended.